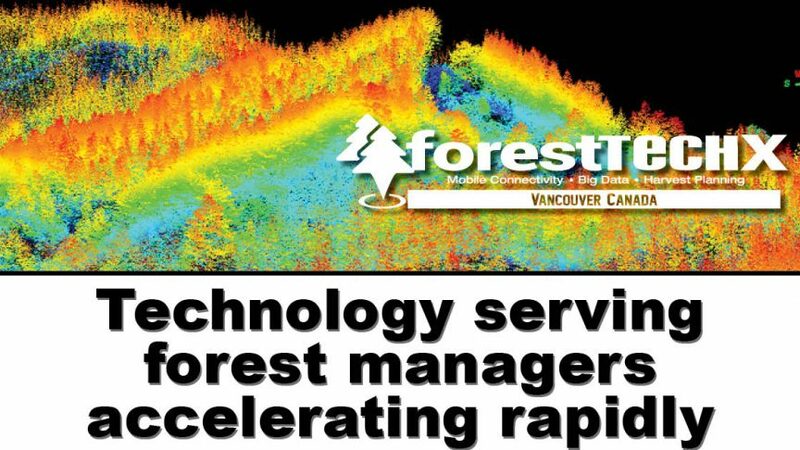 Vancouver, BC – With the speed of technology devices and software applications improving faster than ever, the need for professional foresters and operations managers to keep pace with the changes is greater now too. A new international forest management technology conference is set to bring all of the latest inventory and harvest planning technologies from around the world to British Columbia in March 2018. “The pace of changes in LiDAR applications and log value measurement is accelerating – that’s why we’ve got the technical leaders forestry metrics for our new conference, ForestTECHX in March 2018,” says conference organizer, Anthony Robinson, associate publisher of Logging & Sawmilling Journal (LSJ). “From Europe and across the Asia Pacific, emerging technologies in forest measurement and management are bringing big advantages to big and small companies,” says Robinson. In partnership with specialists from Australia and New Zealand, the ForestTECHX conference next month draws on people with a great track record there. We’ve had a great response from delegates including chief technology officers, forest managers and information specialists at many of the leading international forest companies. Robinson is certain Canadian licencees and private forest land managers stand to gain a lot from the experienced panel of international experts who have come together for this ‘new-to-BC’ conference. University of British Columbia’s own Dr. Nicholas Coops is one of the keynote presenters. He is Associate Dean, Research and Innovation in the Department of Forest Resources Management. He is also the Canada Research Chair in Remote Sensing.